In Kenya thousands are suffering from food shortages and malnutrition. To fight this people were already eating rats, ants and now crickets is a thing. This is no joke, farmers are rearing crickets to boost their finances as well as tackle food insecurity. The University in Kenya has trained many people mostly illiterates to rear crickets. People have found this venture very interesting and don’t require much investments. The university first identifies a potential farmer and then train them for a month and eventually end up giving them crickets for a start up. The university helps the farmers with marketing and sales. People find cricket farming much easier than crop farming. Crickets are very nutritious and doctors advise mothers to feed their children with crickets to fight malnutrition. 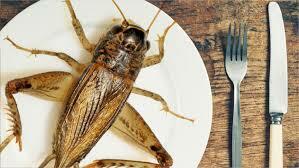 Crickets are rich in proteins, zinc, iron, copper, calcium and low on calories. A kilogram of crickets is sold at $5, it’s very cheap and quick to cook. Often you’ll find fried crickets as snacks or paired with steamed rice.